In about a year I'll have enough money to either super charge my 325i or sell my car and use the sc money and buy a used E46 M3. I would love to own an M car but I have already put a lot of money into my car and I would just want to do the same stuff to the M3 but wouldn't have the money to do so. On the other hand it would be cool to own a supercharged sleeper 325i. so yeah any thoughts would be appreciated. Well, it depends on what you're after. If it was me, I would make the sleeper 325i, for multiple reasons. One, when people mess with you, you can put them to shame without them knowing what hit them! Second, you've got 4-doors, the M3 doesn't. How much cooler would it be to transport people in the back AND impress them at the same time? Third, your car would be UNIQUE. The uniqueness factor is something I always go for, even if it isn't "as much fun". That's why I consider engine mods in a car with the body that has diving board bumpers! Ultimate sleeper, my friend, and quiet honestly, I would sacrifice quite a bit to make my car [unique]. Your car is already unique, with your stealth look going on. Supercharge your ride (literally) to make it one ultimate sleepermobile. haha I like your style thats what I was leaning towards, I have a dog so 2 doors would get old quick and with my current mods + sc I bet I would be close to if not as fast as a stock M3. I guess I could always save my M car days for when I can afford a brand new one built to my specifications, ah that far far away day. I guess I sort of knew the answer to my own question but whenever I talk about doing it theres always a couple people that are like why don't you just buy a used M3 its the same power and its an M so i figured it be cool to see what peoples opinons about this are. I like the angle eyes on your e30 they actually look like they belong on the car, unlike some e36's, off topic. I'd go for the E46 M3. If you're talking about power and speed, this has been proven wrong time and time again. An Ariel Atom can out-accelerate ANY BMW and only has a 4-banger. A Mitsubishi Evo VIII FQ400 can not only keep up with most supercars but even flat-out beat some of them. In the end it comes down to what is more important to him: practicality and uniqueness or "the real deal". We are talking BMW though. FI has some advantages. But so does NA. My theory is the motor was designed for NA. I know plenty of M42s with a DASC that run just fine, yes. But with NA, you can still go to FI. Besides, an M3 is already all sorted out. The question was SC or a NA E46 M3. We both gave our opinions. Hard choice lots of good points. In the end both options would result in fantastic rides. Myself I would go the E46 M3 as it is the complete package, there is much more to them than horsepower, if you haven't driven one you should go find one to test drive, it is a phenomal car. There are major differences between the two including the suspension, braking, oil pump system, exhaust system, engne valve (Double Vanos) management, differential (M diffs are variable lock) etc etc. The S54B32 motor won many international engineering awards. The E46 M has every system designed for performance driving. So a happy problem and it sounds like a year to sort it out. either a tuned 325i and a E46 M3 would be fantastic rides, and yes there are no 4 door E46 Ms, as there shouldn't be. and yes there are no 4 door E46 Ms, as there shouldn't be. How could you say that???? The E46 is my favorite body style and they HAD to skip a 4-door version of it... WHY? yeah it would have been pretty cool to have an M sedan for that year but what can you do. I forgot about the LSD that the M comes with. My dad had an e46 M3 two years ago so I've driven it plenty, ahhh, I have a lot of time to make up my mind but it is a hard decision. Especially since I have the dog, he loves to stick his head out the window but wont sit in the front seat, so that could be an issue. You sure you want a dog in a Bimmer? Dogs don't do pretty things to cars, even if they're well-behaved. The rear seats will get messed up sooner or later... I wouldn't ever let my dog in my back seat if I had an M3. Hell, I still wouldn't let him in there even though I've got the stock crappy 325e rear seats. But, what do you like better? well thats why I'm conflicted lol, I got a 325i with the faux leather which doesn't scratch at all and if it looks like it did all you have to do is clean it and it looks like new, my dogs super well behaved he only gets dirty paw prints on the rear seats and I usually keep a towel down so that doesn't happen that often, other than that he just gets slober on the little side window next to the rear passenger window. 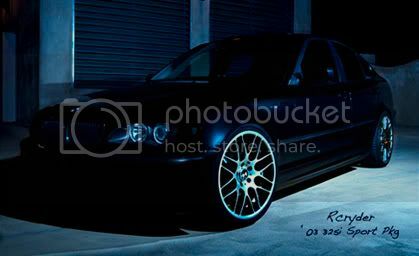 I agree that the E46 is a very special design, and with time may reach the ranks of the E30. My comment/perspective on the lack of the four door is honestly my own bias. I think sportscars, and I put the E46 M3 solid into the catagory, should have 2 doors. Sports sedans, like the E34 and the E39 M5 have four door and find a balance of performance with the ability to move 2 more adults, or a dog, or a car seat. I love my E34, but see it as a sports sedan (on steroids), one of the best ever created. But I see the M3 as a sports car, one I can take to the track, enjoy a 12 turn 2.5 mile circuit and then drive home. So one more thought...the right answer may be to buy the E46 M3 in a year, and then two years later super charge it! Sports sedans, like the E34 and the E39 M5 have four door and find a balance of performance with the ability to move 2 more adults, or a dog, or a car seat. I love my E34, but see it as a sports sedan (on steroids), one of the best ever created. hmm that brings about another choice, maybe I should get an M5, I love the E34, how fast is it and how does it handle, I lke the way the e39's drive but theyre kind of bland style wise, and the original m5 is great too, my friend had a fully restored black and tan one. if I got an e34 m5 i could still have money left over to do some upgraders, those have hp in the 300 range right? Agree as well... I love my E34 M5 but it is first and foremost a sedan that performs (almost) like a true sports car. I know this because I am always running with the E36 M3's on the track, if they are stock, and pull away from them on the straights consistently. The E46 M3's, on the other hand, run me down consistently and are much better sorted out all around. In fact, slightly tuned E46 330's are pretty hard to catch as well. I have driven some students M3's on the track and am very impressed. I absolutely love my M5, I have never taken anyone on the track with me that didn't find its' performance incredible, the sound intoxicating and the comment "this thing should not handle and perform like this" I have heard more than once. Still, Like Calypso said, there is so much more inherently engineered in the E46 M3 and take it from me, they are reliable and not overstressed while performing at high levels. Not sure how stressed your 325 engine will be with the iron lung over pumping oxygen into it. I understand about the dog, I have two greyhounds and they love the "ride" so they get the X5 or the Pathfinder, NEVER my M5. I get enjoyment spending time with them and seeing them have fun, don't change that relationship. Like mentioned in an earlier post, you have a tough decision, but either will have a great result in the end. That said, I absolutely love the look and stance of your car....The wheels are incredible and I am glad you have not gone with some crazy mods...very tasteful and clean. I would take that in a heartbeat and I feel, should you decide to go with M3, you would get some decent money for it based on what I see. While off topic for this thread, I see you are interested in the E34 M5 as well. If you want some information on the US version I drive, click on my cardomain link in my signature. Just FYI, the US version 3.6l, all came with 315HP and many have been chipped and are in the 330-340hp. I get 13.9 @ 101 in the 1/4 and these will run 170mph. There are a few Euro 3.8l in the US that have 340hp and more torque, but are basically the same car as the US. A friend has one FS here http://tinyurl.com/c9r6xe. There is a link within the description to additional pictures. thanks, I hate tacky mods too, I have an M-tech II bumper going on the front next month (the 330i zhp bumper) that should help out, its an OEM bumper too, my stock bumper got pulled out in the front because of one of those cement things at the end of parking spots, I went over it and when I reversed it tore the front right off haha, minot lapse in judgement. I am now thinking that maybe the sc would just create more problems in the long run and would probably make the car a hassle to own after a while, but I dunno cus I dont know how bad they are for the car really I'm jsut assuming. The e34 might be a bit too old of an interior for me, I just scrolled through a bunch of e39 m5's and my friends dad had a Dinan'd one that he loved, maybe that would be the practicle thing, its 4 door, and is just a tad faster than the M3 according to 0-60 times, but the M3 looks so damn nice. I'll keep you guys posted. That interior is something you will learn to love. TRUST ME. Having an E30, I HATED the interior and exterior design when I first bought it (I really wanted an E36 as my first car but couldn't afford it) and then over time I grew to love this car. Now, I think it's one of the best BMW designs ever! 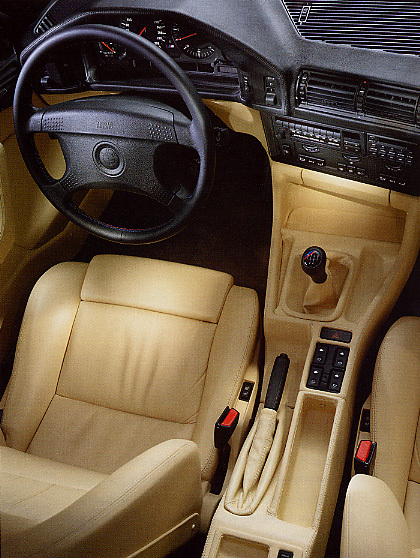 The E34 interior is top-notch, IMO. The placement of controls is excellent and it does make you feel like you're in your element. Plus, there's more room in the back for dogs or preferably, people. They're bit a expensive though, but for the money you're willing to put down for an M3, you can get one no problem. I would LOVE to sit in and see THIS every morning! maybe I didn't word myself right what I really should of said was no armrest haha, thats my biggest hang up, I've driven E30's and an E28 M5 and that always bugged me plus I think I'd rather have the power of the E39 M5 which I have started to kind of fall for now that I've been looking more. A black one or a dark grey one would be sweet you can find them with 90,000 to 100,000 miles for around 16-18,000 and they were pretty much all owned by older well to do gentlemen so even at that mileage they have had religious maintenance and show room interior, I noticed that with 7 series too, they always have immaculate interiors with high mileage. I can see you are a firm beleiver in getting all the mileage you can out of a car. Is the center console high enough to use as an arm rest in the E34's? That euro M5 that someone posted a link to earlier was gorgeous but I'm not a fan of the cloth interior at all...but it is a great looking euro model.